Attention Deficit Hyperactivity Disorder, also known as ADHD, is one of the most prevalent psychiatric diseases in childhood adolescence across the globe (Polanczyk et al, 2005). 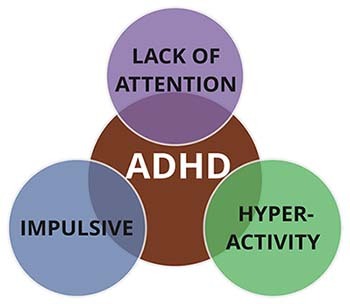 Children with ADHD find difficulties with their inattention, hyperactivity, and/or inability to control their impulses. These lifelong symptoms are caused by numerous neurotransmitter systems and various brain functions. Prenatal conditions such as low birth weight, prematurity, and prenatal exposure to alcohol and/or other toxins are external risk factors. The socioemotional environment during postnatal development and food constituents/micronutrients can also contribute to ADHD symptom severity (Capusan et al, 2005). There are many risk factors in early development associated with ADHD, such as delivery method, gestational age, type of feeding, maternal health, and early-life stressors, all of which have an effect on the gut microbiota of patients with ADHD. It is known that in turn, food intolerances and chronic inflammation are highly suspected in ADHD, which leads to the assumption that gastrointestinal dysregulation may be involved in this disorder (Prehn-Kristensen et al, 2018). The gut-brain axis is the biochemical signaling pathway that takes place between the gastrointestinal tract and the central nervous system. Regarding the gut-brain axis and the influence of microbiota on the central nervous system, the disturbance in a child’s early microbiota may change the gastrointestinal environment making the child more prone to psychiatric disorders (Prehn-Kristensen et al, 2018). It is still unclear whether juvenile ADHD is accompanied by alterations in the human microbiome (microbial diversity). Prehn-Kristensen et al. hypothesized that young, male patients with ADHD display a reduced diversity and differ in microbial composition when compared to healthy controls. These findings were also tested for their heritable relationship upon patients with ADHD and the same patient’s parents. In order to test their hypothesis, Prehn-Kristensen et al. compared the gut microbial communities of young males with ADHD to those without the disease. 10 out of the 14 patients had been receiving medication (Methylphenidate) for more than a year to treat their ADHD symptoms. Because ADHD has such a high heritability rate, they also screened parents for possible ADHD symptoms using a self-rating questionnaire. The diversity of microbes within a given body can be described by the richness and evenness, by the number of species in relation to the species’ abundance within a sample (the alpha-diversity). A high alpha-diversity is linked to a healthy state. The authors found that using some measures, diversity was significantly decreased in ADHD children compared to the disease free controls. The authors used a more specific test to find particular bacteria responsible for group differentiation. This analysis discovered two species related to ADHD belonging to the group Bacteroides. The healthy controls had biomarkers for Prevotella and Parabacteroides, and the ADHD patients were connected to Neisseria. At the family level, analysis showed elevated levels of Prevotellaceae, Catabacteriaceae, and Porphyromonadaceae for controls and Neisseriaceae for the ADHD children. ADHD children also showed higher abundances in the family Bacteroidaceae. They found that Neisseria and Bacteroides species are potential ADHD-associated biomarkers. Both genera contain commensal species which are part of the healthy human microbiota (Hooper et al, 2001). Although they did not determine the particular species within Neisseria and Bacteroides, they are still well-known pathogens in these genera that may be involved in ADHD pathogenesis. More specific testing, known as LEfSe testing, showed that the family Prevotellaceae was significantly more abundant in controls, while the patients with ADHD showed elevated levels of Bacteroidaceae. Members of the Bacteroides are normally beneficial to the gut microbiome. However, they are also capable of producing complex mixtures of amyloids, lipopolysaccharides, neurotoxins, and enterotoxins which can impact not only the gut microbiome, but others areas of your body such as the central nervous system (Prehn-Kristensen et al, 2018). By including patients’ parents in this study, they were able to observe that mothers of ADHD patients had a reduced alpha diversity compared to mothers of the controls. Alternately, there was no difference in alpha diversity between the fathers of the patients and the controls. We are able to conclude that alterations in the microbiome composition might be passed on maternally, even though males are more affected by ADHD than females (Prehn-Kristensen et al, 2018). Some limitations of this study were that only 10 out of 14 children had taken MPH as medication for over the last year before discontinuing it 48 hours prior to collection. If possible, it would’ve been great to distinguish particular groupings of children taking ADHD medication or have all patients receiving medication for around the same time. While there was no evidence that this had an effect on the study, it would be interesting to understand how ADHD medication alters any potential gut microbiota of various patients. Another limitation of this study was the sample size and that all subjects were located from one area of the world. Grasping an idea of teenagers from different countries, including various geographic and ethnic backgrounds would help us obtain more generalizable knowledge if all evidence had similar trends. Including females in the study would enable researchers to investigate gender effects. I think that it was unnecessary to gather information about household income for each patient and control. However, they did take into account diet which would help us better understand how certain consumption of foods can influence the intestinal microbiota and provide a basis to support treatment strategies in ADHD, since the microbiome is also influenced by nutrition. “ADHD Child vs. Non-ADHD Child Interview.” YouTube, My Little Villagers, 14 Oct. 2015, www.youtube.com/watch?v=-IO6zqIm88s. Capusan AJ, Kuja-Halkola R, Bendtsen P, Viding E, McCroy E, Marteinsdottir I, et al. Childhood maltreatment and attention deficit hyperactivity disorder symptoms in adults: a large twin study. Psychol Med. 2016; 46(12):2637-46. Epub 2016/07/05. doi: 10.1017/S0033291716001021 PMID: 27376862. Polanczyk GV, Salum GA, Sugaya LS, Caye A Rohde LA. Annual research review: A meta-analysis of the worldwide prevalence of mental disorders in children and adolescents. J Child Psychol Psychiatry. 2015; 56(3):345-65. Epub 2015/02/05. doi: 10.1111/jcpp.12381 PMID: 25649325. Reynolds, Jennifer L. “Is There a Connection Between Gut Health and ADHD?” U.S. News & World Report, U.S. News & World Report, 8 Sept. 2017, health.usnews.com/health-care/patient-advice/articles/2017-09-08/is-there-a-connection-between-gut-health-and-adhd. Another paper by Alexander Prehn-Kristensen, et al.